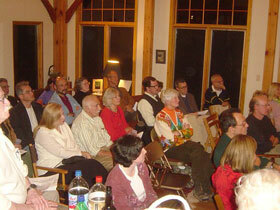 Approximately 45 people gathered in a living room in Kent for the inaugural Second Sunday Series Salon which included short play by James Shearwood, a poetry reading by Alan Devenish and violin and viola duets played by Paul Ehrlich and Wendy Neiman. Place: a street on the West Side of Manhattan. A resident of NYC, Kevin O'Brien has appeared in the films Friday the 13th Part III, Serial and Warlock. He appeared in the acclaimed mini-series Studs Lonigan as well as CHiPs, Quincy M.E. and Knots Landing. Stage credits: The Mystery of Irma Vep, Lovers and Hail Scrawdyke. His recent directing credits have included Guys and Dolls, The Bat, and Adventures at the End of the World. 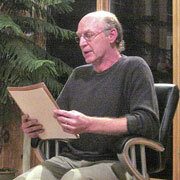 A resident of Kent Cliffs, James Shearwood has been a long-time member of the Theatre Faculty of Sarah Lawrence College. His plays have been produced in NYC, Paris, New Orleans and at the Yale Cabaret. As an actor he has appeared in NYC at EST, AMAS Rep, Womenâ€™s Interart, New Federal Theatre and Playwrightâ€™s Horizons. His play Kiss 2006 will be in the Porch Project at the Depot in Garrison in November. Alan Devenish teaches at Westchester Community College and leads poetry workshops at Bard College. His poetry has appeared in College English, Poetry Northwest, Gargoyle, Chain, Cortland Revue (online), others. Born in Bushwick, Brooklyn, he now lives in Kent. Paul Ehrlich is a well known violinist and string quartet player. He was Concertmaster with the Baton Rouge Philharmonic Orchestra, Assistant Concertmaster with the New Orleans Symphony Orchestra, Concertmaster with the Lyndhurst Concerts, and Concertmaster for several local symphony orchestras. He has also played with the New York Philharmonic Orchestra and toured with New York Pro Musica as solo violinist. Wendy Neiman has played in many local symphony orchestras.